﻿ The assertions of Nickelback being the “worst band in the world” are grossly exaggerated. Perhaps switching out “worst” for “most inoffensive” would be more accurate, as the band’s method of staying well away from any sort of boundaries has led them to become the faces of radio rock, for better or for worse. It’s easy to see why that would rub some the wrong way though, given their system of churning out a near identical album skeleton that’s just slightly fleshed out for each release. But even when they do decide to dip their toes outside their comfort zone, the results still aren’t exactly thrilling. The embrace of funk, disco and Flo Rida features of 2014’s No Fixed Address might’ve been different for them, but compared to the really exciting stuff out there, it barely offered anything. And judging by the buildup to Feed The Machine, it would appear that Nickelback themselves are denying whatever stock that direction had, given their choice of preview tracks for this ninth album. They even follow the classic Nickelback cross-section that virtually all of their material adheres to – a heavier but incredibly broad take on politics; a big ballad for the guaranteed rock radio airplay; and something slightly more melodic pitched between the two, enough to assume that this is little more than the latest product to come off the assembly line. Except, maybe not, as Feed The Machine shows that Nickelback might actually be trying, doubling down on their heavier, more rock-oriented side that they can actually do fairly well, rather than just another reskinned version of the base template. That’s not to oversell this by any means – by nature, a Nickelback album demands expectations to be tempered – but by those standards, Feed The Machine does indeed pull a few tricks that are worth repeated visits. Of course, that all depends on the tolerance level for Chad Kroeger’s hemmed-in howl of a voice, though to be fair, it’s a lot more natural when paired with a more metal-leaning sound. The likes of Coin For The Ferryman and For The River mightn’t be brimming with colour or texture, but there’s a sublime amount of crunch that’s certainly preferable to the washy guitars of Song On Fire and After The Rain, or the clumsy drag of The Betrayal (Act III). Even the power ballad Home carries actual details of gritty realism to fit comfortably alongside some of the album’s heavier cuts. Don’t construe that mean that Nickelback have improved as songwriters by any significant degree, though. Again, it’s best to view this aspect in an altered light; no one really comes to a Nickelback album expecting high-class poetry, and what they do bring to the table proves serviceable enough. This isn’t as drastic of a zooming out as the band have been in the past with various topics, but to some degree it can work. Even with the initial talk of the album primarily focusing on the 2016 Presidential Election, it’s really only the title track and Silent Majority that tackle anything of the sort, and even then, they fire so widely that they can be applied to virtually any political upset in modern history. It might seem like swinging for the fences, but Nickelback do have something of a personality that they can put to good use. The nonsensical collision of nursery rhymes on Must Be Nice and the blatant rehash of Photograph that is Every Time We’re Together might be stupid or redundant, but they at least mark some playfulness or wistfulness between the macho-man posturing of a track like Coin For The Ferryman. Again, that might be giving more praise to Feed The Machine than it realistically deserves; these are pretty basic features, and the fact that a band nine albums in can pull them off is really nothing to write home about. But given Nickelback’s limited skills in terms of artistic modulation and the pure populism that oozes through this album’s veins, Feed The Machine does actively hit something of a win. It’s about as inessential as any other Nickelback album, and this won’t be what brings the vehement detractors to Kroeger’s side, but to deny there’s some enjoyability here would be unfair to a band who deal with that sort of thing on a regular basis. 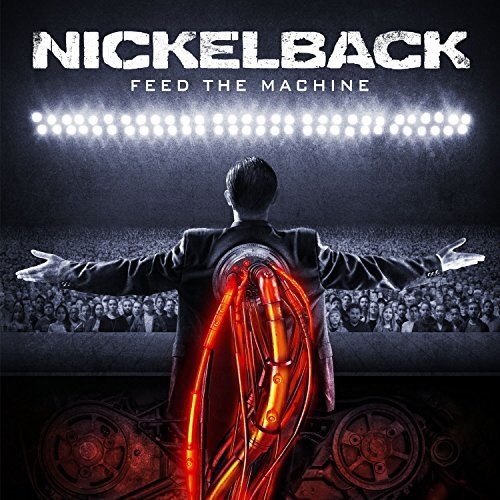 ‘Feed The Machine’ by Nickelback is out now on BMG Rights Management. I do not understand this hate Nickelback. I’ve just recently started listening to them and found dome good music. Guess to each their own. I’m now a Nickelback convert?